Blue Star Paros was built in South Korea, delivered to Blue Star Ferries in 2002 and has been operating around the Greek isles since. Blue Star Paros has numerous facilities for its 1474 passengers to enjoy onboard which include, a variety of cabins and air type seating in pleasant comfortable lounges, gift shop, open deck café and a self-service restaurant. 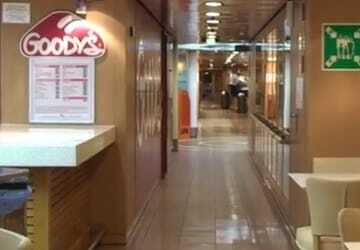 There are two main places onboard where you can purchase food and beverages. First off there is the Flocafe which offers a selection of hot and cold foods and drinks, secondly there is Goody’s which is Blue Star Paros main restaurant offering a fast food like menu. Please Note: Whilst we have taken great care in making our Blue Star Paros guide as accurate as possible, onboard facilities, services and entertainment may vary depending on the date and time of year that you travel, facilities mentioned may change without notification and ferry companies reserve the right to operate vessels other than those mentioned at time of booking without prior notification. Modern facilities. Anyway i miss the rigging of old boats, the crowd the near contact with the sea. "A fantastic way to get to Symi"
We caught the Blue Star biat from Rhodes to Symi and were very impressed with the cost, the boat and the crew. The fare was extremely cheap and a lot better value than the only competitor. Crew were available when we arrived and helped us to stow our luggage. 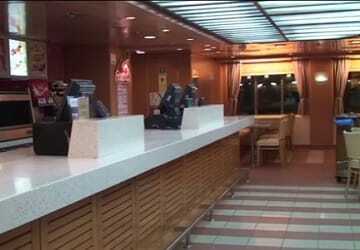 The boat was spotlessly clean and well equipped with bars and cafes. Very comfortable seats both on deck and inside. A fantastic way to arrive on Symi. We were not able to use Blue Star for the return journey as the times were not compatible with the flight. Although the business class area is well worth the extra amount, it saddened me to see selfish people lying across whole sets of seats, limiting the space for others. 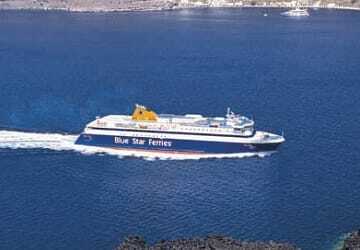 I had a positive experience traveling with Blue Star Ferries from Rhodes to Tilos and back again, a bit more than 2 hours one way, and I would travel with them again. The ship was clean and the air lounge seats were comfortable. I didn't use the bar so I can't judge that. I made a reservation through Direct Ferries which was quite comfortable. I only needed to pick up the tickets at the port. I would use this service again. A fast and very comfortable ship. I will use this service again. We travel every year from Scotland to Paros. On the way across we find its good to take a cabin if youte2on the early boat, you can board and then climb back into bed. Cabins are immaculate, staff are wonderful and show you to your room. This also gives you access to the lounge so no scrambling for a seat. Great service all in! My experience with Hellenic sea ways was good. The ship's facilities were clean, catering was satisfying, staff was helpful and the ship departed on time although it delayed to arrive in Naxos. Obtaining tickets, which previously I had booked and paid for on line, at the Blue Star Ferries office at Piraeus was straightforward. On 21 June on the Blue Star Delos the staff at the point of embarking and disembarking were very helpful with regard to heavy luggage and the barman on the top deck was particularly pleasant. I take this company every year as the ships are large, modern, very clean and well furnished most with escalators. The staff is friendly and professional. Almost always on time and very well priced-- far better than sea jets or other fast boats. Beautiful cabin and wonderful service. Great green tea! We would prefer a more orgaised disembarkation method. "Blue star on time and good service"
Everything as advertised, good price, left and arrived on time. Service and staff are surely competent, but on three route only one was punctual. We travelled with Blue Star Ferries in September on the Mykonos-Paros and Paros-Naxos routes. It was good. 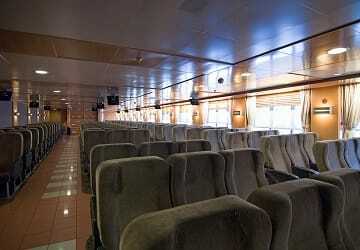 New and well minteined ferries, cleaning on board was good, good the punctuality and the staff on board... In conclusion a nice experience, I will surely recommend it and we will use it again. "ECELLENT TRIP WITH REASONABLE PRICE"